Eckhart Hubner, music professor at the University of the Arts in Berlin, is the featured bassoonist on this recording and also conducts. He performs with Kurpfalzisches Kammerochester, the well-known 12 piece chamber string ensemble based in Mannheim. The bassoon has been described in many ways. Heinrich Christoph Koch called the bassoon the “instrument of love” (Musikaliches Lexikon, 1802) because of its gentleness of nature. At the other extreme, the instrument has been labelled as “the buffoon of the wind family” (The Musical Companion, 1984). A friend of mine once compared a bassoon solo to a sneeze - you know it’s coming but you can’t do anything about it. Even though solo works for the bassoon are rare, this disc features four concertos written primarily for the instrument. This CD features three concertos by Rosetti and one by Mozart and all of them are composed and performed in the same style. These are classical, highly structured works that follow the pattern of the times in which they were written: late 1700s. These pieces can best be described as light and airy. Listening to them brings a sense of wonder, hopefulness and optimism. These concertos are in three movements. The first is lively or fast, followed by a slower second and a finale that picks up the pace and is played fast, typically as a rondo. The soloist plays against a contrasting orchestra to develop the melodies, usually slightly ahead of and leading the orchestra, which follows and harmonizes in accompaniment. If the bassoon is the instrument of love, then B flat could be the key of romance. Both Rosetti and Mozart composed beautiful concertos in B flat, and Eckhart demonstrates remarkable ability, dexterity and range. 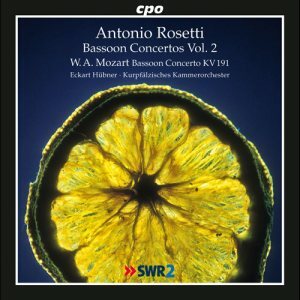 Mozart’s Bassoon Concerto is more demanding for both the soloist and the ensemble. It contains longer solo runs for the bassoon in both the first and third movements. This piece is one of the most well-known compositions for the instrument and is often used for bassoon auditions. Rosetti’s Concertino in E flat major has a rather slow and sad second movement. Performed in the key of C minor, the deep echoing of the bassoon stands in sharp contrast to the delicate violins. This movement will draw the listener back particularly for that beautiful bassoon solo. The liner-notes are by Gunther Grunsteudel in German and have been translated into English by CPO regular Susan Marie Praeder.